or tell us a bit about you, so we can find the offers that might be best. Do you live with a partner? For families with children under 12 (or under 17 if disabled). You need to earn at least £131 a week. If you’re earning less than £131 a week but are under 25, or you’re an apprentice, you may still be eligible. You may still be eligible if you will be starting paid work in the next 31 days. You each need to earn at least £131 a week. You may still be eligible if you and your partner will both be in paid work in the next 31 days. Your income is above the threshold for this scheme. Your household income is above the threshold for this scheme. Get an estimate of how much help you can get with Tax-Free Childcare and other offers. If you're a working parent with children under 12 (or under 17 for disabled children), you can open an online account to pay for registered childcare. The government will top-up the money you pay into the account. For every £8 you pay in, the government will add an extra £2. You can receive up to £2,000 per child per year - that's up to £500 every three months. 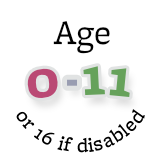 If you have a disabled child, you can receive up to £4,000 per child - that's up to £1,000 every three months. You, and any partner, must each expect to earn (on average) at least £131 per week (equal to 16 hours at the National Minimum or Living Wage). You can't get Tax-Free Childcare if either you, or your partner, each individually expect to earn £100,000 or more. For families with 2-year-old children. You need to be receiving support. 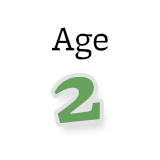 To be able to take up 15 hours of free early education for your two-year-old you must meet the eligibility criteria. Please visit GOV.UK for further information. The 15 hours of free childcare/early education for two-year-olds is not intended to cover the costs of meals, other consumables (such as nappies or sun cream), additional hours or additional activities (such as trips). Providers may charge a fee for these additions. If you choose to pay for these it is an arrangement between you and the childcare provider. However, you must not be required to pay any fee as a condition of taking up a 15 hours place, and must be offered alternative options. For families with 3 and 4-year-old children. Find out more about similar schemes in Scotland, Wales / Cymru, and Northern Ireland. 15 hours of free childcare is available for all families in England. From 1 January, 1 April or 1 September following your child's 3rd birthday. The 15 hours free childcare/early education offer is not intended to cover the costs of meals, other consumables (such as nappies or sun cream), additional hours or additional activities (such as trips). Providers may charge a fee for these additions. If you choose to pay for these it is an arrangement between you and the childcare provider. However, you must not be required to pay any fee as a condition of taking up a 15 hours place, and must be offered alternative options. You can't get 30 hours free childcare if either you, or your partner, each individually expect to earn £100,000 or more. 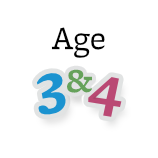 Your child can start in their childcare place the term after they turn 3 years old and have received a valid 30 hours code, whichever is later. Term start dates are 1st September, 1stJanuary and 1st April. To keep your 30 hours free childcare place you need to check your details are up to date every 3 months. 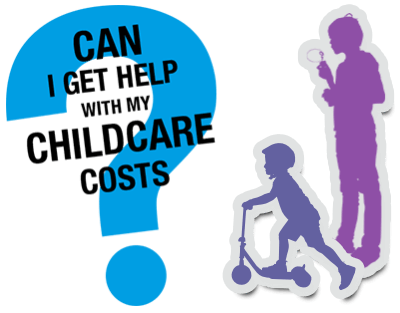 The 30 hours free childcare offer is not intended to cover the costs of meals, other consumables (such as nappies or sun cream), additional hours or additional activities (such as trips). Providers may charge a fee for these additions. If you choose to pay for these it is an arrangement between you and the childcare provider. However, you must not be required to pay any fee as a condition of taking up a 30 hours place, and must be offered alternative options. 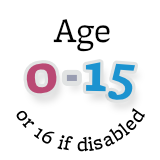 For families with children under 16 (or under 17 if disabled). Tax credits are closed to new applications for the majority of people from 1 February 2019. You need to be working more than 16 hours a week (£125 a week at the National Minimum Wage). If you’re earning less than £125 a week but are under 25, or you’re an apprentice, you may still be eligible. Each of you need to be working more than 16 hours a week (£125 a week at the National Minimum Wage). If you cannot make a new claim for Tax Credits, you may be able to apply for Universal Credit instead. If you are an existing tax credits customer you can claim back up to 70% of your eligible childcare costs for children under 16 (or under 17 for disabled children). Depending on your income, you could get up to £122.50 a week for one child or £210 for two or more. What's happening to Tax credits? Universal Credit is replacing a number of existing benefits, including tax credits. If you are already receiving tax credits, you don't need to do anything now. For families with children under 16. You need to be working. If you're about to start work, you could still be eligible. Both of you need to be working. If you're about to start work, you could still be eligible. You, and any partner, must be working, or you’re due to start work, and are claiming Universal Credit. Whether you can claim will depend on where you live and your personal circumstances. 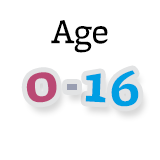 You can claim back up to 85% of your eligible childcare costs for children under 17. You could get up to £646 a month for one child, or £1,108 for two or more. Universal Credit is being phased in over the next few years. It will replace a number of existing benefits, including tax credits. You need to be studying. One of you needs to be studying. You could get weekly payments through Care to Learn if you're under 20 at the start of a publicly-funded course, such as a school or sixth form. You can apply for Discretionary Learner Support to pay for childcare if you're 20 or over and in further education, for example, if you're studying for an NVQ, BTEC or PGCE. You can apply for a Childcare Grant if you're in full-time higher education to pay for childcare costs for children under 15 (or under 17 if they have special needs).